Learn more about our agency resident program. Learn more about the volunteer opportunities for health professionals that live in our communities. See recruitment notices for full-time and part-time employment. In 2018, Skamania County EMS adopted policy and established a Resident Program. The intent of the Resident Program is to cooperate with educational institutions and technical training programs to recruit and train students interested in pursuing a career related to emergency and non-emergency medical services or public safety. Additionally, this program may be offered to students who, though they do not intend to pursue a career as indicated above, have a desire to give back to their community while obtaining education at a center of higher education. Persons selected to fill a position with our Resident Program will supplement services provided by paid personnel to provide greater community outreach at programs and events. On a scheduled basis and in conjunction with paid personnel they will provide emergency medical and rescue services. At a minimum, applicants to the Resident Program must have or be able to obtain, prior to the program start, an Emergency Medical Responder certification. Priority will be given to applicants who have or are enrolled in EMT certification courses. Skamania County EMS identifies persons selected to participate in our Resident Program as volunteers. These persons have willingly agreed to provide emergency medical response on behalf of the agency. More specifically, a volunteer is identified as someone who freely gives their time and contributes services for civic, charitable or humanitarian reasons. Our Resident Program provides for a monthly stipend of $200.00 for each month in which the resident meets minimum activity levels and program requirements. Further, to encourage and support our program participants, Skamania County EMS provides an opportunity for residents to receive educational tuition incentives. Complete details are available in our Volunteer and Resident Program Policy. Skamania County EMS endeavors to build a program that motivates and retains volunteers, recognizing that volunteer service is beneficial to the daily operations and long-term success of the agency. Persons who have a history of service with fire or emergency medical response agencies will find our volunteer program beneficial and inclusive of opportunities to give back to their communities. Volunteers who serve as a member of our scheduled duty staff will supplement services provided by paid personnel to provide greater community outreach at programs and events, and to provide necessary coverage during known and unanticipated times. Volunteer personnel are not intended to replace paid part time or full time staff, but rather to provide additional benefit to overall agency programs. 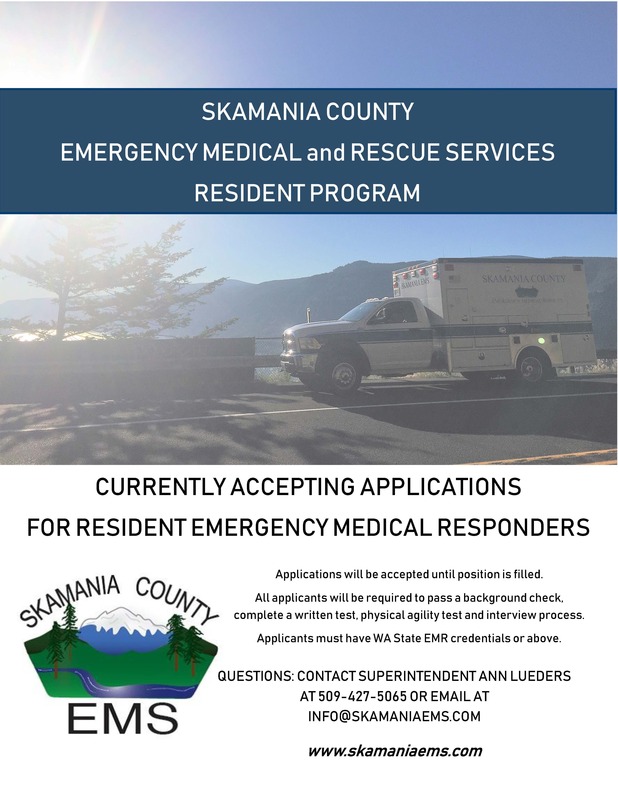 Skamania County EMS recruits and tests applicants for our Volunteer Program a minimum of once yearly, in January- February. Volunteer recruitment notification will be posted here. We do not accept applications outside of the recruitment period. Skamania County EMS employs both full time and part time personnel. The agency determines need based on current staffing levels and as necessary can establish an eligibility list when there are no vacancies. The 2019 hiring process has been completed, future hiring opportunities will be listed here. We are proud to serve Skamania County residents and visitors. Our Chief, Commissioners, staff, and volunteers are committed to providing quality service across our 1,672 square mile service area every day of the year.